I've just finished another batch of research, and perhaps my final pending on how the data turns out. While I was getting up at 5am and coming home at 8pm, I didn't have the energy to cook anything. Dinner was usually my first meal of the day and often consisted of 2-minute noodles or a pasty. Anything I make quickly and shove in my mouth before collapsing into bed. Needless to say, I fell off the CBC bandwagon once more. 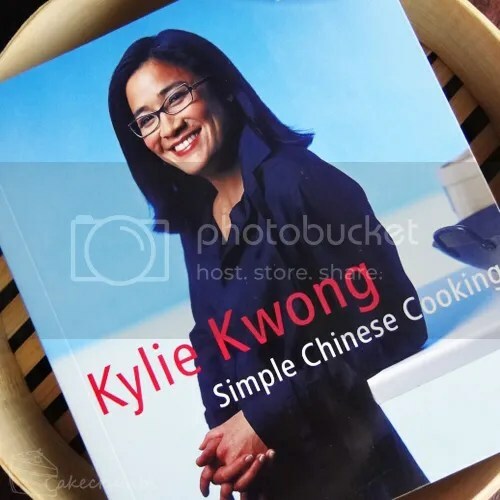 This week, I was extra excited to pick it up again given that this week's book is Kylie Kwong "Simple Chinese Cooking". 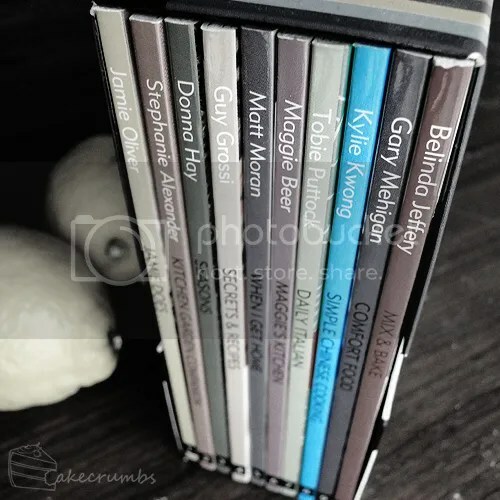 Kylie Kowng is an Australian chef who is as charasmatic as she is brilliant. She takes the Cantonese cooking she learned from her mother and applies the chef-fy skills she's learned in her adult life. But my favourite thing about her is that she's a proponent of sustainable food and ethical eating. Her restaurant famously uses only local, organic and biodynamic produce and has won awards for it's sustainablity. I've been a nature and animal lover as far as I can remember, and in my adult life a Zoologist. Conservation, sustainablity and animal ethics are among my highest priorities in life. I've found that a lot of people think that to eat and live sustainably means to go without all the good things. Kylie and her restaurant show just how easy it is to have amazing food that is sustainable. While flicking through the book there were so many tempting recipes I wanted to try, but for the challenge I wanted to focus on something that was as new as possible. When I found the duck recipe, I knew I had to try it. I've never eaten or cooked duck before, so this was definitely a new challenge. 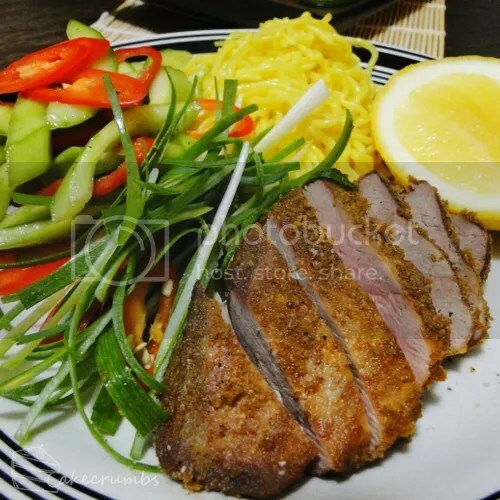 "This is so simple yet so tasty and inpressive – impressive because so many people are wary of handling duck. 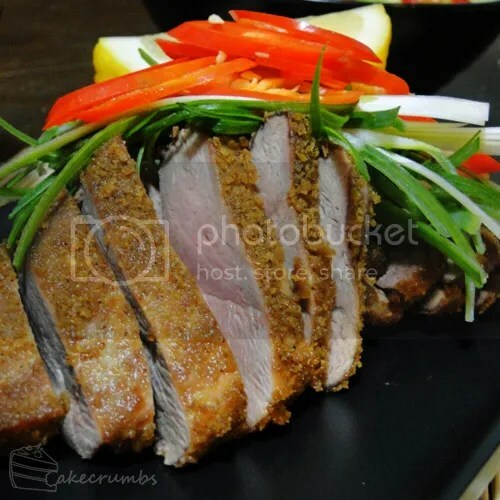 If you feel intimidated about preparing duck (it is really not that difficult), then please try this recipe using duck breasts. You steam the breasts, then roll them in chilli salt for flavour, and deep-fry them. Serve them with Sichan pepper and salt, and fresh lemon. YUM!" My most serious challenge, however, was finding half of the ingredients I needed. No supermarket, butcher or otherwise stocked most of them. As for duck, even the specialty poultry butcher at the local plaza only sold small whole ducks at $20 a pop. This dish needed 4 and I wasn't prepared to spend $40 for it. It was here I discovered the many Asian marts the next suburb over. I don't know how I've never shopped there before. I'm so in love. It was stocked with so many traditional ingredients I could never find and has always travelled into the city for. And so cheap. I wanted to buy the whole store. I picked up a single large duck here for $14. The only downside was that it was a whole duck. As in feet, head, eyes. Everything. I have no idea why I was so confronted by this fact. I've dissected more animals than I can count during my undergraduate degree and I am well aware of, and comfortable with, where my meat comes from. But for some reason I was unnerved at dealing with it. It only took me a few moments to get over it, but I found this initial reaction interesting, if not hypocritical. As a meat-eater, I do think it's important to know where your meat comes from. Getting our meat pre-butchered and delivered in neat packages leads to a detachment. Dealing with an entire animal, I think, makes you respect the produce and where it has come from. Once I overcame my intital unease, I deconstructed the duck, preserving the wings and legs for a later meal and divided the rest up for my puppy's dinner. It wasn't the prettiest filleting job in the world. I'm sure butchers would have been facepalming at my efforts. But I ended up with two fairly whole fillets to work with. I also am terrible at reading and following recipes, so I forgot to leave the skin on. Be smarter than me, the recipe asks for skin on. I got those on the steamer and set about making the Sichuan pepper salt required for both dishes I was making. The aroma coming off of these was fantastic. While I was organising this, my helpful boyfriend peeled, chopped and removed the seeds from the cucumbers for me. While the duck was cooking and resting, I prepared this side dish that is also from Kylie Kwong's book. These are Hot and Sour Cucumbers. The name intrigued me and I love cucumbers. My boyfriend doesn't like them all that much, but I decided to make them anyway. No regrets. Not only did I love this dish, he did, too. I was very doubtful as I was preparing it. The separate elements smelled a little overpowering and funky. But once they were all comibned, it became a perfectly balanced dish I can't wait to have again. It's very refreshing. This recipe makes quite a lot, so it's ideal for a banquet. I just got to eat lots of leftovers. As for the duck, I was similarly apprehensive. I've no idea why, but I was convinced I wouldn't like duck. Or perhaps concerned is a better word. There was something about eating duck my brain didn't want to accept. but I've always said I'd try anything once, so I couldn't back down now. Me and my boyfriend has our own mini banquet set up. We had both the dishes with singapore noodles. The smell as I was cutting up the duck not only changed my mind, I almost started salivating. Not only did I love the taste of the meat, Kylie's recipe is amazing. Everything from the coating on the duck skin, to the chillies and spring onion, to the addition of sichuan salt and lemon. Perfection. I actually said to my boyfriend that it felt like we were sitting in a Chinese restaurant. The flavour combination is not something I'm used to having at home. The tastes and smells took me back to some of my favourite meals he has taken me out for. I could hardly believe that I had cooked it. Except I could, because it was so simple. I could have eaten a lot more of this. I will have to find somewhere that sells the fillets next time so I can buy a whole heap and make this for many people without having to try to find uses for the rest of the duck meat. 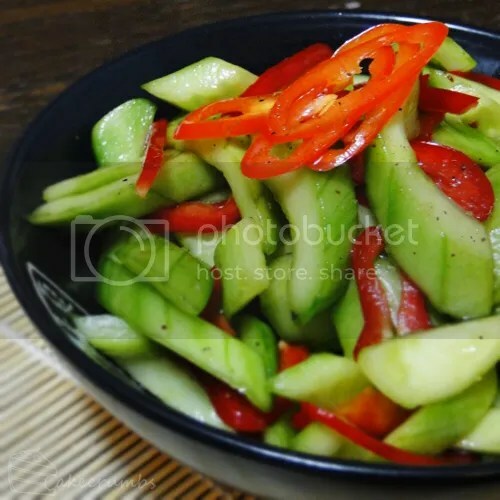 Not only was it delicous, with the sweet and sour cucumber especially, it felt totally refreshing. One of those meals you sit back after and feel great about eating, rather than stuffed and ready for a nap. I had a lot of the flour coating leftover given that I only used two breasts, and so I made this the following night with chicken. It was also delicious, so feel free to use chicken breast if you have trouble finding duck. But the duck version was definitely better. 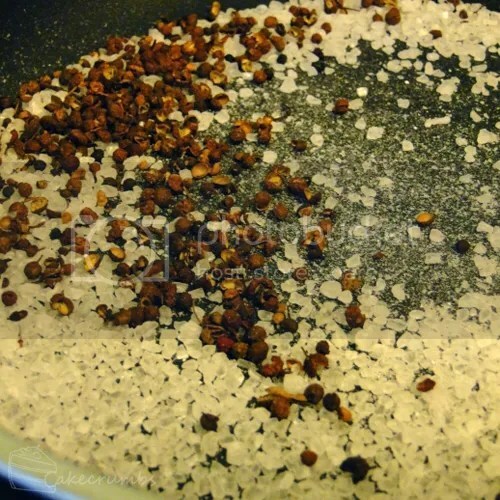 To make the Sichaun pepper and salt, dry roast peppercorns and salt in a heavy-based pan. When the peppercorns begin to 'pop' and become aromatic, take off the heat. Allow to cool, then grind to a powder in a mortar and pestle or spice grinder. Set aside. (Makes 4 tablespoons, store in an air-tight container). 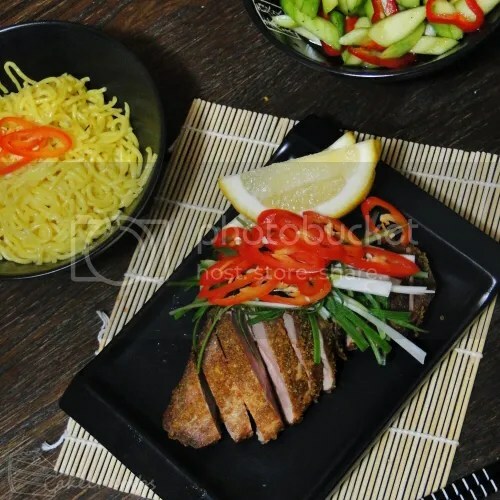 Arrange duck breasts, skin-side up, on a heatproof plate that will fit inside a steam basket. 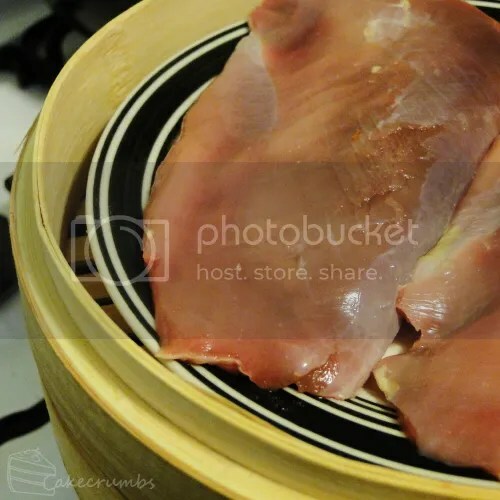 Place plate inside steamer, position over a deep saucepan or wok of boiling water and steam, covered, for 12 minutes or until duck breasts are half cooked. Meanwhile, in a large bowl, combine flour, chilli powder and salt. Carefully remove plate from steamer basket, transfer duck breasts to a rack and set aside for 25 minutes to cool slightly. Add duck breasts to chilli salt mixture and toss to coat well, shaking off any excess flour. Heat oil in a large hot wok until surface seems to shimmer slightly. Add duck breasts and deep fry for about two minutes or until just cooked through and lightly browned, then remove and drain well on kitchen paper. Cut duck onto the diagonal into 1cm (1/2 in) slices and arrange on a platter with a small bowl of Sichuan pepper and salt. Garnish with chilli and spring onion, and serve immediately with lemon halves. Grab the printable version for this. Kylie's note for this dish reads; "This dish should be served on the day of making. It makes a wonderful accomaniment to a banquet served for a long lunch! Refeshing, salty, sweet, sour and spicy – YUM! My kind of food." Meanwhile, combine vinegar and extra sugar in a small, heavy-based saucepan and stir over heat until sugar dissolves. Simmer, uncovered and without stirring, for about 8 minutes, or until reduced by one-third and slightly syrupy – you should have about 3/4 cup. Set aside to cool. Drain away excess liquid from cucumbers. Add cooled vinegar syrup and remaining ingredients to pickled cucumbers and transfer to a serving bowl. And the printable for this one is here. I love Kylie Kwong! Your pictures are always beautiful, fellow Australian! Yay fellow Aussie! I always get surprised when I see Aussies on here – I’m so used to everyone being American. Thanks for your lovely comment, I’m flattered you think so. Hoping one day to upgrade to an SLR so I can take much better photos. I am helpful boyfriend, yay! It certainly did feel like we were eating in an authentic asian restaurant. I didn’t know you were so worried about me and the cucumber. =P Cucumber isn’t my favourite thing, but I was pretty sure with some flavour/sauce it would be great.